I can't think of a better example of how social network marketing and the world of Twitter helps GLBT travel agents in today's world. 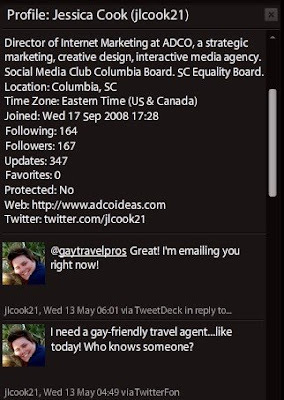 Jessica Cook put out into the "Twittersphere" that she was looking for a gay-friendly travel agent, using a program called TwitterFon. Within 2 hours, she had an immediate response from GayTravelPros using TweetDeck, one of the more popular programs designed to interface and work closely with Twitter. As you can see above, looks like the start of a beautiful relationship!